Sized to fit quarter sheet pans and most 9” x 13” dishes, the rack slides in and out smoothly, putting your food within reach easily and safely just like a Wolf range. Three rack positions offer flexibility for broiling, baking, and toasting. Whether it’s baking sticky, melt-in-your mouth cinnamon rolls for a family brunch or roasting hoisin pork tenderloin for an intimate meal, the Wolf Gourmet Countertop Oven can withstand the rigors of any kitchen. 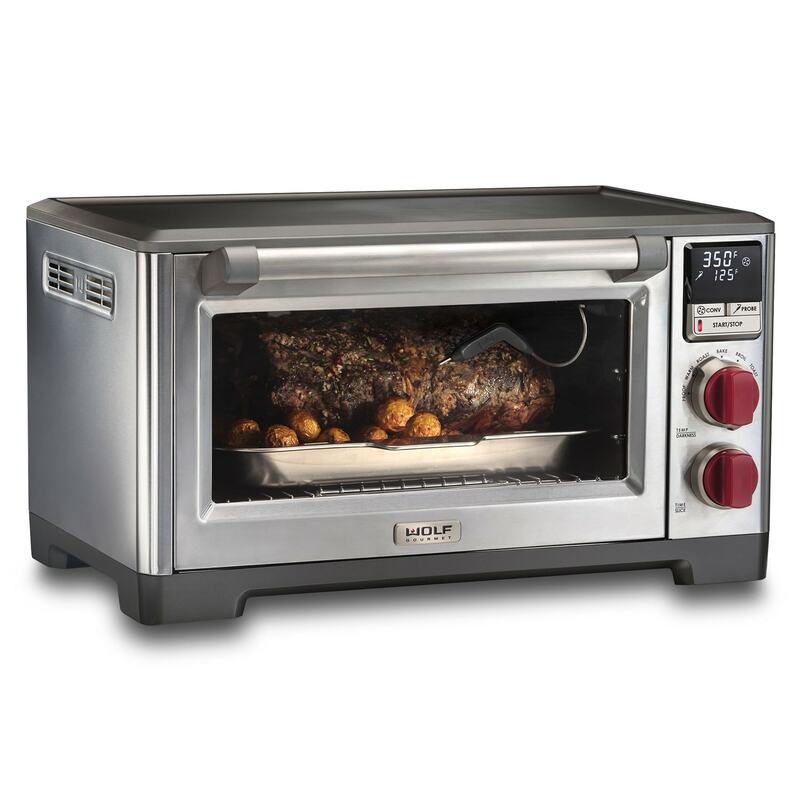 Six cooking modes provide complete cooking flexibility: Bake, Roast, Broil, Warm, Proof, and Toast. Baking pan is perfectly sized for the Wolf Gourmet countertop oven. Lets you monitor your meat's internal temperature as it cooks, eliminating the need to open the oven door and ensuring perfect results. Easy-glide bake rack smoothly slides forward to put dishes safely within reach. The removable stainless steel crumb/drip tray is dishwasher safe and slides out for easy cleaning. Broil rack is perfectly sized for the Wolf Gourmet countertop oven. It can be used as a cooling rack or with the baking pan for broiling.